The Caribbean is a large topic for any vacation, especially sailing. 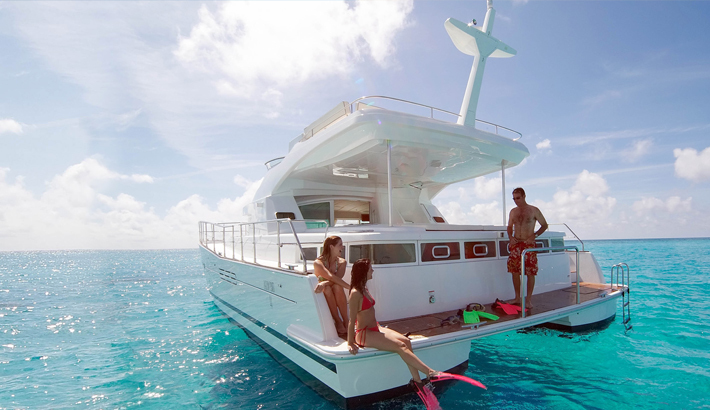 Our suggestions focus on the areas that are easily accessible from St. Martin, a popular Leeward Island charter base and our charter bases in the Windward Islands. Be sure to check out our recommendations for sailing the British Virgin Islands, the top Leeward Island sailing destination. Whether you captain your own ship aboard a bareboat catamaran charter or let our crew handle all the details for you on one of our all-inclusive crewed catamaran charters, we offer these suggestions to help you plan a memorable Caribbean sailing vacation. • Exotic flowers and fruit to tantalize your senses. There’s a lot going on in Martinique day and night…and all on the deliciously slow Caribbean time. On the western side of the island, you will discover some of the Caribbean’s most visually stunning and safest anchorages. To the south, long, enchanting beaches provide ample swimming and diving offshore from land or from your boat. The northern area is dominated by the active Mont Pelée, which erupted in 1902. Both novice and veteran bareboat captains will find sailing out of St. Martin that matches their skill levels. The area in the Leeward Islands just at the northern tip of the Windwards, offers short passages, easy navigation, and options for exhilarating open-water passages and challenging reefs to negotiate. Trade winds are steady between 10 and 25 knots with weak tidal currents due to insignificant tidal ranges of less than 1.5 feet. All sailors and passengers including our all-inclusive charterers can experience secluded coves, deserted beaches, and pristine waters teeming with life in the nearby Leeward Islands. All can be enjoyed at anytime as St. Martin and the other Leeward Islands offer pleasant climates with average year-round temperatures of 80°F (26°C). Ashore, St. Martin and neighboring islands offer something for every age and interest from shopping, dining out, dancing, club hopping, casino gambling, and exploring at many historic sites. In the water charter guests can SCUBA, snorkel, swim, sunbathe, kayak, paddleboard, and relax aboard with a refreshing cocktail. St. Lucia is a small tropical pearl that is still a relative secret. When you think of quintessential Caribbean, the image in your mind is St. Lucia from natural wonders to incredible forests to warm hospitality. Also, a volcanic island, its signature twin peaks, called The Pitons, rise dramatically over 2,000 feet from the water. Hiking trails traverse the mountainous rain forests to reveal giant ferns, wild orchids, and birds of paradise. It is a challenging 4-hour hike to the top of Gros Piton, but if you take it on, you will be grandly rewarded with amazing vistas and a great place for a selfie to share. Visit Soufriere, the world’s only drive-in volcano. Relax with a mineral bath in natural thermal pools at Diamond Baths. Count stars at an anchorage in Marigot Bay, one of the Caribbean’s most alluring spots. Join a “jump up” at Gros Islet. Shop the Castries market and Craft market. Take in a round of golf. If your sailing vacation is in May, be sure to catch St. Lucia Jazz & Arts Festival. Flying fish and dolphins will help you navigate in and around the islands that make up St. Vincent and the Grenadines. Breathtaking scenery, picturesque villages, deserted beaches, and calm anchorages are at every tack. Port Elizabeth on Bequia offers shopping, dining, and historical sites. Tobago Cays (at right) is a marine park encompassing a group of islets with unparalleled snorkeling on showy, vividly colored coral reefs in which you are usually the only party enjoying them. Like all the Caribbean’s Windward Islands, St Vincent and the Grenadines are covered lush tropical forests and framed by sensational volcanic terrain. Pure white beaches, post-card bays, and phenomenal diving and snorkeling will have you planning your next vacation to the area before you leave. The independent nation is made up of a main island called Grenada and a small chain that stretches north as far as Carriacou and Petite Martinique into the Grenadines. Grenada’s sailing grounds are within vacation cruising distance of St. Vincent and the Grenadines, St. Lucia, and Martinique. The nation is the world’s second largest nutmeg supplier as well as a leading producer of cocoa, cinnamon, cloves, and ginger. It is often referred to as the “Spice Isle”. Verdant rain forest stretch across the island down to the picturesque Caribbean coastline. Ashore, you will find plenty of history and culture to explore. Like most Windward Islands, Grenada was a prize that England and France warred over during the colonial era. Remnants of both European cultures can be found. The main island has many historical estates, forts, museums (one with a building built in 1700), and even a distillery from the 1800s. When planning your Grenada visit, look for one of the many cultural festivals. Its protected area on the north side of the island. Sergeant Major fish, Blue Tang, Spotted Drum, Trumpet fish, and Yellow Tail Snapper are just a few of the colorful fish you’ll enjoy watching dart among the sea plumes and sponges. If you are lucky, you will glimpse Hawksbill Turtles. Dragon Bay offers shallow snorkeling with lots colorful coral reef and fish. Also, look for octopus, lobster, sting rays, and green turtles. Grenada’s Underwater Sculpture Park in Molinere Bay offers a unique snorkeling experience…an underwater art museum in clear and shallow water, dappled by sunlight. A series of underwater sculptures are located between the coral reefs. The original works depicting Grenada’s colorful history, culture and folklore are by British sculptor, Jason De Caires Taylor, and a number of local artists. The variety marine life adds to the adventure as art and nature interact. Grenada offers incredible sailing experiences as well, especially southwest of the main island. From St. Georges, the capital, around the island’s southern tail that is home to innumerable deep slices in the coastline that offer quiet calm anchorages with beachside restaurants and excellent places to just chill. The island is well-organized for tourism so a short taxi ride from almost any point will take you to enjoy the natural beauty of the rain forest such as in Grand Etang National Park. North of Grenada, it is a day’s sail to Carriacou. While the sail may be a bit spirited and there is little shelter so plan accordingly. But you arrive in a world completely different than the well-developed Grenada island. You will be sure that you have sailed into a post-card. The best anchorage to find a bit of civilization is Tyrell Bay that offers a few shops and restaurants. But, if you are well-prepared, you can forego civilization and bask in the Caribbean sun beating down on the clear waters and pristine beaches of Carriacou and its neighbor, Petite Martinique. Winds in Grenada blow from the east to northeast 15 – 20 knots December through April, changing to east to southeast 10 – 15 knots the rest of the year. As with all Windward Islands, the islands’ western and southern coasts offer the calmest overnight shelter.